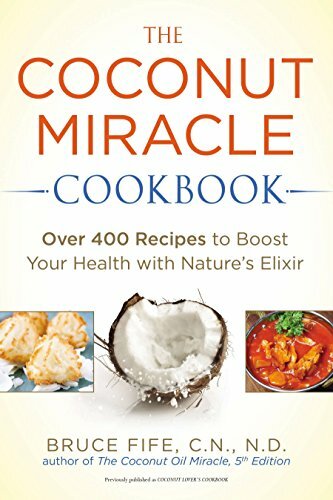 [PDF] The Coconut Miracle Cookbook: Over 400 Recipes to Boost Your Health with Nature's Elixir | Free eBooks Download - EBOOKEE! Description: Bruce Fife, bestselling author of The Coconut Oil Miracle, presents a companion cookbook and a complete guide to reaping all the health and beauty benefits of cooking with coconut Healthy, rich, and delicious, coconut is natureâ€™s miracle healer. The Coconut Miracle Cookbook explains the benefits of coconut, and shows readers how to incorporate this superfood into meals every day with more than 400 delicious recipes. Coconut has been shown to have countless health benefits, including: Weight loss Preventing heart disease, cancer, diabetes, arthritis, and many other degenerative diseases Strengthening the immune system Improving digestion Preventing premature aging of the skin Beautifying skin and hair Reap the health and beauty benefits of coconut oil, milk, water, and cream. Feelâ€”and seeâ€”the amazing results. 2017-10-10[PDF] The Healthy Hound Cookbook: Over 125 Easy Recipes for Healthy, Homemade Dog Food Including Grain-Free, Paleo, and Raw Recipes! No comments for "[PDF] The Coconut Miracle Cookbook: Over 400 Recipes to Boost Your Health with Nature's Elixir".